Identifying inversely regulated genes in CFs during pathological versus physiological remodeling. Linear network representation of Venn diagram depicting the relationship of gene expression changes in CFs from C57BL/6 animals between 10-day swim or 10-day TAC versus controls. For each list, significantly changed genes (q < 0.05) were retained if at least 1 condition attained an FPKM > 1. The number of genes retained in each condition is indicated in plot and were sorted by their log2 fold change. Corresponding tan bars indicate –log10 q value, and lines between the 2 columns indicate common genes. Lines in blue, red, or green denote the 23 genes displaying expression changes in opposite directions. Detoxification genes that are enriched in swim and downregulated in TAC are represented and identified in blue, and known profibrotic genes that are enriched in TAC and downregulated in swim are represented and identified in red. Green lines indicate inversely expressed genes. 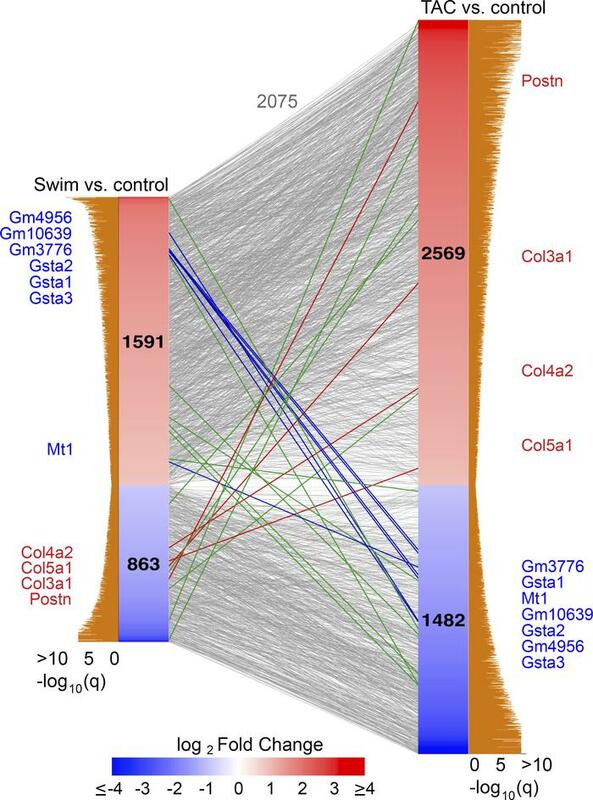 Gray lines represent genes in either swim vs. control or TAC vs. control that move in the same direction.